At the age of 12, Lucas suffered from headaches, seizures, weight loss, and double vision. These symptoms, along with numerous others, led his mother, Alexis, to take him to the doctor for a checkup. After running multiple tests and x-rays, Lucas was diagnosed with Medulloblastoma, a cancer of the brain. "It hit us like a ton of bricks, and it's been a difficult time since that fateful day," Alexis explains. The day after he received his diagnosis, Lucas went in for surgery to remove the tumor. He spent the next few weeks in the hospital recovering, and was released just before starting more treatment. "It has been extremely difficult on him since his release from the hospital, as he had to start radiation and chemotherapy almost immediately," Alexis said. 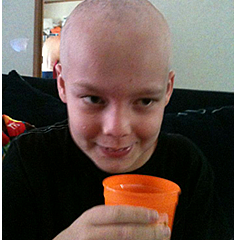 "NCCS helped us out with our gas expenses to and from Lucas' treatments, and it has made it a bit easier to deal with. I am eternally grateful for what we received, as it is hard to remember at times that we are not alone in this struggle," Alexis said about the support she received from the NCCS. "Sometimes we find ourselves so wrapped up in our troubles that it is hard to think about the fact that many other people are facing the same troubles we are."